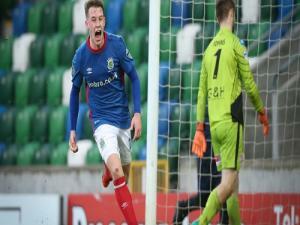 Kyle McClean celebrates scoring Linfield's winner. Pic: NIFL. It was a dramatic Saturday afternoon in the Danske Bank Premiership. Linfield stayed six points clear at the top after storming back from 2-0 down to beat Coleraine 3-2 at Windsor Park. Second-placed Ballymena - who have a game in hand - maintained their title challenge with a 2-1 win against Institute at the Brandywell. The Sky Blues have a busy week ahead with an Irish Cup tie at home to Portadown scheduled for Monday night and the League Cup final against Linfield on Saturday. Glentoran won 5-0 away to Warrenpoint, who had two players sent off - Ciaran O'Connor for dissent and Fra McCaffrey for violent conduct after kicking ex-Celtic midfielder John Herron. Lukasz Gwiazda and Darren Murray both struck twice for the Glens. 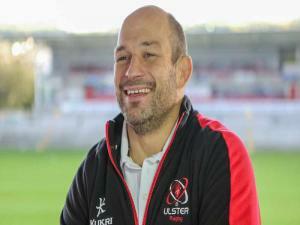 Gary Smyth's team move up to seventh, the final European play-off place. Crusaders crashed to a 1-0 defeat at Dungannon and last year's title winners are now 12 points behind Linfield with 10 games to play. Paddy McLaughlin's first game in charge of Cliftonville ended in a 1-0 home win against Newry. And Glenavon beat basement club Ards 2-0 at Mourneview Park.